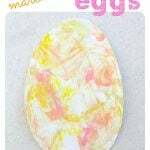 Bouncy Egg Experiment - I Can Teach My Child! Have you ever seen a raw egg bounce? How about seeing the yolk of an egg while looking at it from the outside? No, you don’t need x-ray vision or superpowers… You just need to try out this fascinating Naked Egg science experiment! The idea for this experiment came from Steve Spangler Science (two awesome resources). A word of warning: Patience is the name of the game with the Bouncy Egg experiment. 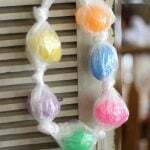 Your child will have to wait at least 3 days before getting to “bounce” their egg. STEP 1. Carefully place a raw egg in a glass jar. Pour enough vinegar in the jar to cover the egg. Let your child watch what happens as you add the vinegar… tiny bubbles will cover the surface of the egg! Let the egg sit in the vinegar for 24 hours. STEP 3. Let the egg in vinegar sit for 2 more days. STEP 4. Pour the remaining vinegar out of the jar and remove the egg. The egg gets significantly larger sitting in all that vinegar, so it might be more difficult to get out of the jar! STEP 5. Let your child hold the egg and observe and talk about what they see. Since the vinegar has dissolved the egg shell, the egg yolk can be seen from the outside! STEP 6. Gently bounce the egg on a table (no more than 6 inches from the table) and let it roll. Observe and talk about what happens with your child. Just be careful… Even though it bounces, your shelless egg can still break! We learned that lesson after our bouncy (and slippery) egg fell off our patio table and onto the deck. Why does vinegar dissolve the egg shell? The shell of an egg is made of calcium carbonate. When you place the egg into the vinegar, you see bubbles, which is the chemical reaction of the acid in the vinegar reacting with the calcium carbonate to produce carbon dioxide. You’ll also notice that the egg gets larger as it sits in the vinegar. That is because some of the vinegar is absorbed in the egg through its semi-permeable membrane! Get instructions for the Bouncy Egg Experiment and 14 other fun and easy science activities below. Click on the link (below) and receive your FREE Science eBook. Hi, your blog really touches me, have been reading it for awhile… Just wanted you to know about a website i started ReadYourBiblesChurch.com… It’s a place for Bible study guides.. I also put a forum in that can be viewed from a mobile device.. I couldn’t find where to contact you privately so I’m commenting, hope that is okay. :) God Bless! I’m a little confused by “The Science Behind It.” It mentions baking soda, but the experiment doesn’t. Did I miss something? Why does the egg get slimy? I couldn’t find where to contact you privately so I’m commenting, hope that is okay. :) God Bless! I love doing bouncy eggs i’ve done more than 29 experiments and they have been a great success try coolscienceexperimentshq.com/bouncy-egg/ or wikihow.com/Make-a-Bouncy-Egg it also works but I feel like this website works better.